About a year ago, I was casually assigned a task to write one guest post per month in the name of the Process Street blog. “What on Earth?” I thought. Only the top writers get published on places like that. I don’t stand a chance. As it turns out, it’s not as bad as it might first seem. In fact, I’ve had a surprising amount of success. Guest posting, like every other thing which requires relationship building, is a long process. While you can score slots on smaller blogs with a quick email, for bigger blogs or news outlets you need to be noticed first. Just like how you’re not going to get very far by proposing on the first date… unless the person you’re pitching knows you’re worth their time (or at least know who you are) they’re not likely to bother with you. Here’s a collection of the knowledge learned about guest posting over the last year which has since led to spots on TechCrunch, The Next Web, Ahrefs, SEMrush, Usability Geek and more. Before you go any further, if you just want to skip ahead and grab a database of 189 guest posting opportunities click HERE. Done that? Good — now head down to ‘Ways to get on people’s radars’. Arguably this is the most important part. Assuming you’re a capable writer, the most difficult part is going to be sitting down, doing the research and then actually speaking to real people. I know this can be tough for writers, so I’m going to run through a few things that can help out. The last thing a writer wants is to look stupid. A stupid writer will never get any readers, so doing the proper research is paramount. The reason you’ll look stupid is if you pitch a post called These 945 Adorable Doggies Will Destroy Your Heart (And Your Shoes) to anywhere other than Buzzfeed. You get what I mean. I’ve made the mistake in the past of pitching even slightly offbeat stories to journalists at Wired and Mashable and never hearing back from them. Now I’ve learned my lesson and I’m trying again, I just hope I haven’t made a mess of it, is all. Anyway, here’s how you find a perfect home for your ideas. Once you’ve built your query, and you see several good spots on the first page, you can scrape the first 100 results into a text file by using the Google URL Scraper from (of course) Ninja SEO Tools. 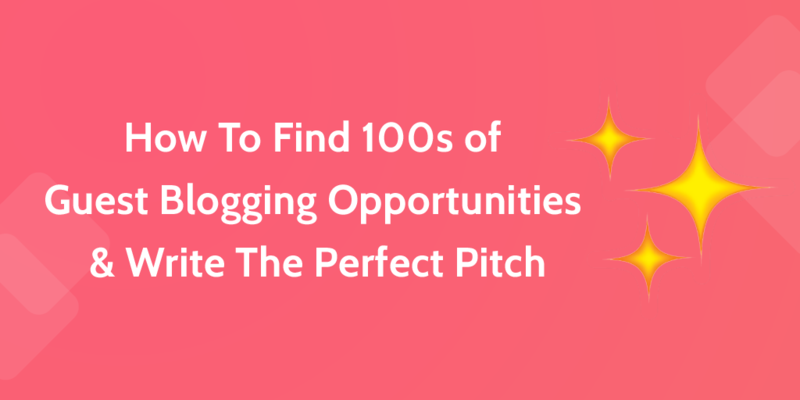 I did it 3 times with slightly different queries (replacing “guest post” with “write for us” and “submit a post”), to get 300 URLs that are likely viable guest posting targets. Then, I pasted the URLs into a fresh Google Sheet with the column title of URLs, and removed the duplicate entries with a tool called (you guessed it) ‘Remove Duplicates’ – get it on the Drive Addons Store. Only three duplicates were removed, leaving me with 297 blogs in my niche that are accepting and publishing submission guidelines for guest posts. Once you’ve built your target list of URLs, it’s time to find out who runs each place, who to target, then to get them to know your name. I’m not going to go on about how to get people’s emails because I don’t do that bit personally, so I’ll direct you onto a checklist for finding almost anyone’s email. Unlike when you’re pitching TechCrunch, it probably doesn’t matter too much who you pitch. If it’s accepted, it will probably get forwarded to the person in charge of the blog at 90% of blogs. Build a Twitter list (using something like BuzzSumo or good old fashioned Twitter itself) which includes the editors – for media outlets – or owners – for smaller blogs. Make a point to interact (heart, retweet and reply) for around 10mins per day. This does two things: makes sure they know who you are, and tells you more about what exactly they’re interested in. 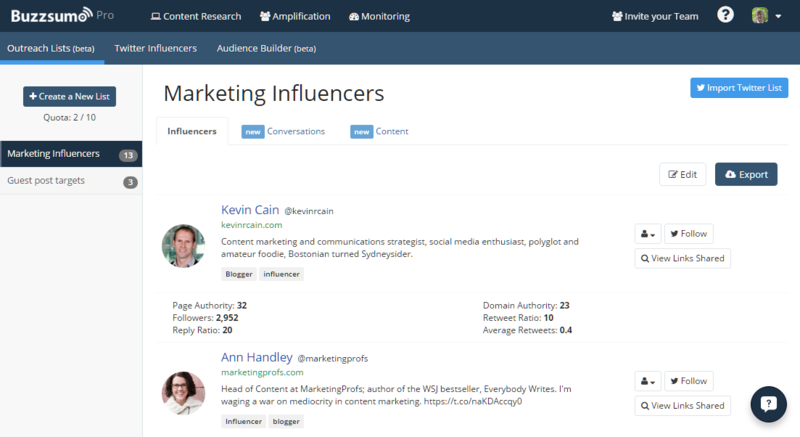 To create a list of Twitter influencers you want interact with using Buzzsumo (there’s a free trial), log into the app, then go to Amplify and start searching for the names of the editors / blog managers for the outlets you want to track. By using the ‘conversations’ and ‘content’ tabs in Outreach Lists, you can find points of interest to interact with them over. An alternative to Buzzsumo is Ninja Outreach. 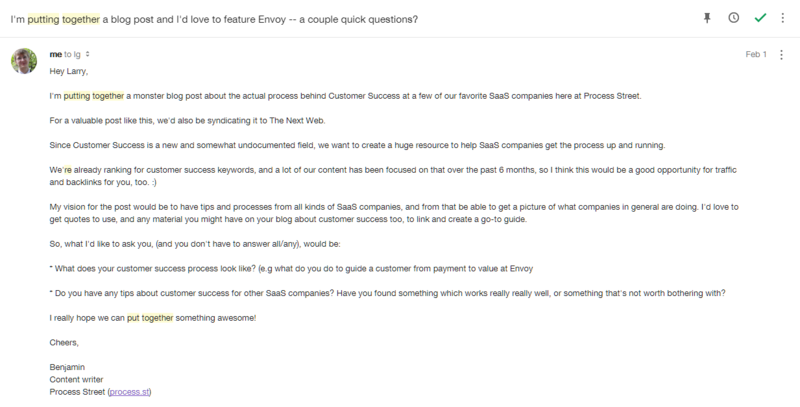 Going one step further than Buzzsumo, it can also automate outreach emails. While most of the time I mention just the people I’m referencing, if I know that I’m writing on a topic covered by a blog I want to pitch and have a choice to link that or another, of course I’ll link the one I want to pitch later down the line. Why? An excuse for interaction. Without this kind of interaction, no one will really know who you are so you won’t be able to get to the state where you can publish something big enough that they see your name first. Body: Hey [name], just a quick note to let you know I mentioned your [what] in a post about [topic]. [personalization]. Here’s the link: [link]. Half the time I’ll get no response. the other half I’ll get a reply (awesome!) or a share (bonus round!). I’ve only done this a couple of times, but as it turns out, people really like being asked for their expert opinion and getting a backlink for their trouble. The great thing about this is that the content writes itself, you get distribution from your interviewees and you build relationships with each of them. When I wrote my guide to the customer success process, I ended up with over 10,000 words of material, a lot of distribution from other SaaS companies and 14 new contacts I can use for pitching and email the ebook to when it’s ready, too. 14 contacts is pretty good, right? It was worth the ridiculous amount of time it took vs. writing something off the top of my head for that reason alone. The great thing about blog comments is that no one does it much anymore. Back in the old days, so I’m told, blog comments were a real hub of discussion. Now, 90% of articles are lucky to get more than a few ‘thank you’s.Commenting on a bloggers post will be something that sticks in the authors mind. In fact, when people are trying to get my attention often the first thing I’ll get is a comment on a blog post of mine. As I said earlier, with BuzzSumo you can instantly see the trending content in any niche. Better yet, with a custom list of influencers, you can see their most recent blog posts. Read them, comment on them, share them and get on the authors radar. A free way of influencer monitoring is to use an RSS reader like Feedly and stay on top of all posts from your targets by putting aside maybe 20 minutes a day to read and comment. Feedly even has a button for tweeting right inside the reader, making it easy to share anything you like. Want to add your earlier .csv of URLs into Feedly to track them? Use URL to Domain to extract just the URLs. I tried for a while to find a way to do this in bulk, but can’t figure it out. Anyone know how? Let me know in the comments. Introduce yourself, justify yourself, give them a list of titles. My name is Linda. I am a professional editor with experience in tutoring. I know that you are super busy, so I’ll make sure that email from me is valuable to you. Analytical Methods to Trigger Emotions With Writing. I have a new piece for you. 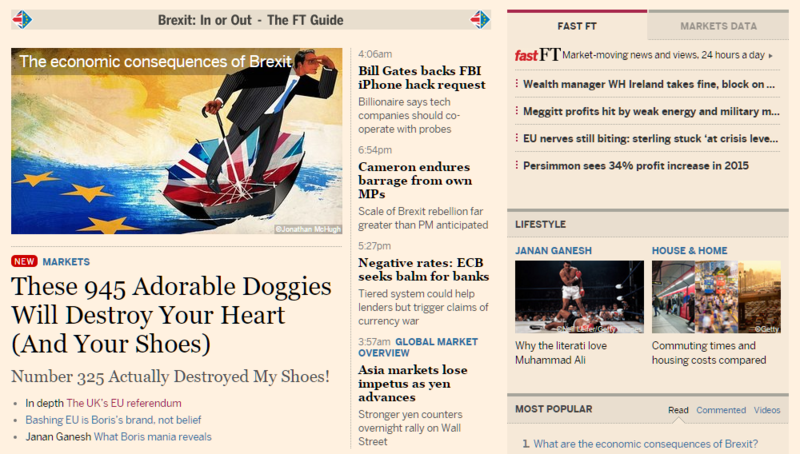 I published it last week on the blog of the company I work for, and it’s getting popular. I think it’d be something you could be interested in for TNW, if you are able to accept syndicated content. It’s about how Minesweeper, Hearts, and the original pre-installed Windows games were a sneaky way to convert command line snobs into GUI users by teaching them keyboard/mouse functions. It’s also got some research in there about how other companies like Slack and Duolingo are doing the same things today. There have been a few times where I feel like I’ve blown it totally. Forgetting about follow-up, being too off-the-cuff and not sending a real pitch… It’s stuff we’re all going to do at one point or another. You don’t get a reply but you feel the tension. If you feel like you’ve wrecked things, back off for a little while then start over (Twitter interactions, comments, etc.) – email them again in a month or two when they’ve got something more positive to associate you with. I’m experimenting a few ways to send and track pitches, but the two best way I’ve found so far is using Close.io. 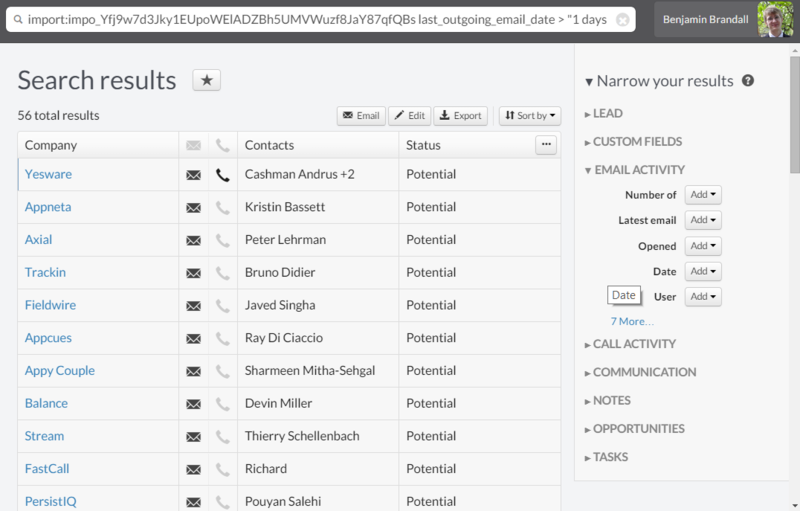 Close.io is a CRM with extremely advanced search functionality. It means that you can, with a little of your own logic, create easily searchable lists that you can bring up every time you have a post in a certain category. It’s not free, but it does have a 14-day free trial so you can try it out before taking the plunge. When you import this CSV into Close.io, you’ll want to map Domain to Lead name, and use the Note column to tag the lead with a unique value you can later search to show ONLY guest post leads in a certain niche. For example #guest-socialmedia. After import, you’ll see the top of the ‘Your Previous Imports’ section has a new entry. Click the link, and save that as a Smart View called ‘Guest posting contacts’. Now you’ll be able to show only your guest posting contacts in a single click, then filter those contacts by the tag in the notes depending on the niche you’re pitching to. Just written a post about content marketing? You should open your smart list and search “#guest-contentmarketing” to see all the contacts you’ve added a note to with that tag (Hopefully you did tag them like I suggested!). Create a template with a great pitch, and then work from top to bottom emailing each contact, personalizing as much as you like. If you add the search filter: latest_email_date < YYYY/MM/DD then you’ll see the list decrease by 1 each time you email someone, meaning the results will only show people you didn’t already email today. Make sure you tick the ‘Remind me to follow up if no reply in X days’ box on each before you hit send, (where X = the smallest number of days you feel polite emailing after, usually 3 for me but 7 for busier places). But if you don’t want to use a CRM, there’s always Inbox or Gmail, both of which will do the trick if you’re only contacting a few people. The good thing about guest posting is that it gets easier the more you do it. If you’ve never guest blogged, don’t worry. It gets easier as you go along. With every pitch you write and post you get published, the more experience and credentials you get to show the next target. Imagine being able to say “Check out samples of my work on TechCrunch” to everyone you pitch in the future. What’re you waiting for? Grab our database of 189 guest post contacts now and get going! Spotted this post on Inbound and wanted to drop a comment to say how helpful it is. I really like how you don’t skip over important details. I also appreciate the process you put in place. I find that process can make all the difference for consistent results. One thing I might add … and I know this is the extreme lazy ask — but you might include a copy of the Google Sheet you reference in your post. I know, I know, how lazy can we all get? Well, it just makes it one step easier for your readers to implement your process. Thanks for commenting both here and Inboung.org, I really appreciate that. You can get a Google Sheet by clicking on the link where it says ‘HERE’ in the intro. The screenshot I took isn’t of a database as big as that, but it does have a little more info. The sheet is behind an email-address-wall (I suppose you’d call it), and subscribes you to the blog posts for the future, but I actually got back a full version of screenshotted one today complete with emails. Tell ya what, I’ll email it to you. I can see your email through the comments right here. Great post – it’s really helpful for me and my team. Great post – it’s really helpful for me. Just wanted to add that having guest posts on your own blog is a great way to increase traffic and build relationships. Guest blogging is very important in now a days SEO. I read about “Guest blogging is dead” in some of the blogs. But i can’t obey this statement as a blogger and marketer. Thank you for this great and useful followup information. Another useful way of finding blogging opportunities is using keyword tracking software like https://brand24.net, for example. After setting up a monitoring project with certain keywords, such tool picks up mentions that are of interest for a guest blogger so that he or she can try to engage later on in the process and end ultimately end up with a guest post entry. Thanks for blog which will help me in my guest blogging like I have been planning to make some guest post on some blog to get visitors and exposure.For me Guest blogging is doing good. Excellent article Benjamin.. Anyone knows if there are any better alternatives to close.io? Preferably a crm tool for customer relation and marketing outreach would be what I would be looking for – a hybrid between helpscout and close.io. I hope you find it as awesome as we do! Indeed al these are Awesome tips for starters who are looking to guest blog for SEO. Almost Every SEO consultant believes that content is the king in SEO. Guest blogging is progressively becoming an essential practice to connect and build one’s online authority as well as community building and acquisition quick backlinks for SERP. Thank you for coming up with this easy guide and sharing links with examples. The information you share will defiantly help the newbies in the industry and also guide those people who want to perform their SEO related Tasks by their own.